University of California Press, 9780520023994, 264pp. Products of the "imagination," such as novels, can be especially useful tools for understanding how things work in societies far removed from our own experience. Through the telling of a story, a sound ethnographic novel conveys more than information. It involves the reader in the dynamics of life in places where the rules for action are very different from the rules the reader makes his own decisions by. Some people believe ethnographic novels are comparable to fieldnotes- the data themselves in their original, unanalyzed form. Though I can see the reason for the analogy, the author still disagree with it. Good fieldnotes record raw experience. For the time being, the anthropologist squelches his desire to interpret, and he writes down everything he can see or remember. Good ethnographic fiction also presents experience raw, without generalization. But in building the story, in selecting to tell this because it is important and not to tell that because it seems trivial, the novelist is analyzing his material. Between the raw and the cooked, both ethnographies and ethnographic novels belong in the processed pot. Anthropologists try to make explicit and public both the method they have used to gather their material and the means for analyzing it. Ordinarily, a novelist obscures his analysis-the grounds for the choices he has made-and depends on the interior logic of the story to make his tale seem "true" or "believable." 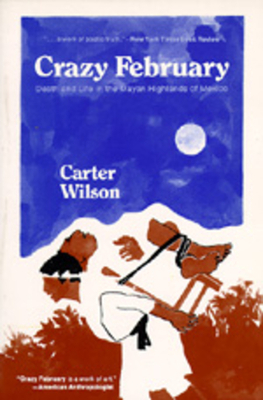 But Crazy February works with somewhat different principles than the author would normally use in writing "fiction." The book grew directly out of field experience. Wilson felt strongly that it would stand or fall on its ethnographic correctness. And so, faced with choices between what the author would like to see in the story and what he thought would actually happen to an Indian in the mountains of Chiapas, he consistently chose "actuality." In a practical, day-to-day writing sense, reality was the author's rod and my staff. And in the end he was very happy when anthropologists with greater experience in the Mayan area found the book essentially exact and, more important, true to the spirit of the place he had written about. Carter Wilson, Professor of Community Studies and Fellow of Kresge College in the University of California, Santa Cruz, has also written I Have Fought the Good Fight (1967), A Green Tree and a Dry Tree (1972), and Treasures on Earth (1981).